Our driving school has much history; established in 1914 we have instructed many generations onto, and beyond, passing their test. Today we have a great reputation, and many of our pupils come to us following a glowing recommendation they’re received from a friend or family member. Lanes will provide you with lessons tailored to you on a one-to-one basis (we’ll never ask you to share any part of your lesson with another pupil). Our instructors will meet you where you wish, drop you off following your lesson and be happy to change days and times of lessons to adapt to your busy life. You’ll learn in a car of exceptional quality. We can deliver theory lessons individually or (as is the more popular choice) your instructor can blend these into your regular practical sessions. Our intensive course delivers a pass in as fast a time as possible. Proving popular with pupils who are hoping to pass in the not so distant future, this course will up the frequency and length of your lessons for quick progression. Moving beyond the big day of your test, after you pass, we’ll still be here to progress your driving. Our post-test driving courses cover: Advanced Driving, Pass Plus, Motorway Driving, and Parking Skills. 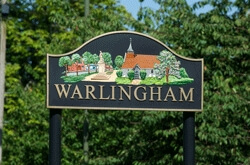 Get off to an excellent start and book your first driving lesson in Warlingham, CR3, CR6 today. Call on 020 8166 5678 or send a message through the contact page. Our driving instructors of course hold all the legally required qualifications in order to instruct (with these being DSA registration and Approved Driving Instructor certification). However beyond these, our instructors have a reputation for helping their pupils focus on driving and forget their fears and nerves. They are also experienced working with students of very different ages (from seventeen up to seventy plus). We have in-excess of 40 qualified driving instructors in Warlingham, CR3, CR6; book your first lesson – phone on 020 8166 5678or visit the contact page. Getting behind the wheel and onto the roads can be intimidating enough, and for some females, the idea of male instruction can make for an added element to experience apprehension about. Lanes provide the option of female instruction – experts who are both reassuring and friendly. When the right learning environment is created, you’ll be able to progress more quickly – so please don’t hesitate to request a female instructor should you feel more comfortable with this option. Our female driving instructors in Warlingham, CR3, CR6 are friendly and skilled nerve settlers – book your first lesson now on 020 8166 5678; alternatively, you may wish to send us a message via our contact form. If you’ve been undertaking a little research about the differences between learning in an automatic and learning in a manual, you’ve likely found many resources that say manuals give more control. That said, automatics do have advantages – namely that you won’t stall and you could learn more quickly. The choice between these two options is entirely yours – should you choose to learn in an automatic, our fleet has suitable, high-quality cars that are ready whenever you are. Already envisaging that red licence? Book your Lanes Automatic Driving Instructor in Warlingham, CR3, CR6 today – Call our team on 020 8166 5678. Alternatively, you can book or send a message over on our contact page.